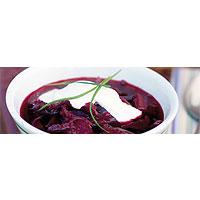 There are many variations of this burgundy-coloured soup, which reflects the Eastern European heritage of many Romany people. This one is in the Ukrainian style. Put the stock and vinegar in a large pan and bring to the boil. Add the beetroot and potatoes. Simmer for 15 minutes or until the vegetables are soft. Add the cabbage and whole tomatoes. Cook for about 10 minutes, until the tomatoes are soft, then remove them from the pan with a slotted spoon, purée them in a liquidiser or push through a sieve, and return to the soup. Add the bay leaf and season to taste. Stir in the onions and cook for 20 minutes until the onions are soft. Garnish with a blob of soured cream and a few chives and serve. A glass of lemony, creamy white would be ideal to keep the soup's richness and freshness intact.